1 Cor 2:1-2 And I, when I came to you, brothers, did not come proclaiming to you the testimony of God with lofty speech or wisdom. For I decided to know nothing among you except Jesus Christ and him crucified. Christ and Him Crucified or the Law; which one of these truly binds Christians together? Which one of these is the one and only source of continuity? The Law is a creation of God. God the Son, Jesus Christ, is the creator. This lesson is guilty of placing the creation above the creator. Genesis tells us what test was given to Adam and Eve, but it makes no mention of why such a test was necessary. The lesson asks for speculation and treats that speculation as Bible study. True Bible study examines what Scripture says, instead of inserting our own concepts into the passage. Where does this passage, or any other passage in Scripture claim that “In order to be able to love, Adam and Eve had to be created as morally free agents”? The authors’ of this lesson have inserted their own beliefs in place of what Scripture actually says. Many will accept this without question because it is reinforcing a concept that they have already been taught. In the process of blindly accepting what is being fed to them in the lesson quarterly, they will begin to believe that Genesis account of man’s fall actually contains this information. The lesson continues with the false idea that “Though after the Fall Adam and Eve were to ‘pass the baton (the Law)’ to the next generation”. There is nothing in Scripture to indicate that Adam and Eve were given any Law except the law that they broke, eating from the tree of knowledge of good and evil. It is another case of the lesson authors’ inserting their own beliefs in place of the Word of God. Read Gen 6:5-10. Who did God find righteous and blameless? Who found God’s favor? Is there any mention anywhere in this chapter (or in any of Scripture) that God considered any of Noah’s family to be righteous and blameless? Gen 6:18, God made the covenant with Noah to save Noah and his family. Hebrews 11:7 Noah’s family was saved based on Noah’s faith. Nothing is Scripture indicates that Noah’s family was any more righteous and Law observant than the evil people who were destroyed in the flood. Adventists repeatedly claim that their teachings are based on Scripture alone and not on the writings of Ellen White. Many Adventists will claim that they don’t even read or pay attention to Ellen White. But here in the lesson, we see an example of how the Bible is interpreted through Ellen White. “Ellen G. White wrote that the designations “sons of God” and “daughters of men” refer to faithful men marrying unfaithful women. What lessons, then, can we learn from Genesis 6 about the church’s interaction with the world?” Not only is Ellen White being referenced to understand what the passage “really” means, but readers are being asked to use her writings as the basis for commenting further on the subject. In today’s lesson we find another Ellen White quote establishing theology. Nothing in Scripture says that the people were questioning the existence of God. Nor does Scripture say that people rebelled against God for destroying the world. These are Ellen White’s additions to Scripture, treated as fact by the Sabbath School lesson. Scripture gives a different explanation--the people were trying to make a name for themselves and avoiding being dispersed around the earth. 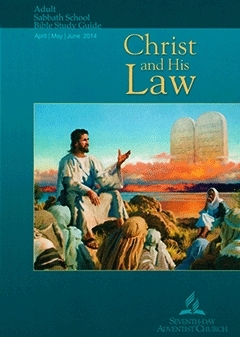 The theme of the lesson so far is that the Law was passed from Adam to Noah to Abraham and eventually to Moses. But this is contrary to Scripture. Rom 5: 12-14 Therefore, just as sin came into the world through one man, and death through sin, and so death spread to all men because all sinned— 13 for sin indeed was in the world before the law was given, but sin is not counted where there is no law. 14 Yet death reigned from Adam to Moses, even over those whose sinning was not like the transgression of Adam, who was a type of the one who was to come. According to verse 13, there was a time with no law defining sin; verse 14 defines this time as ranging from Adam to Moses. The Law was not a source of continuity running from Adam to Moses. According to Galatians there is not a continuity of Law running from Abraham to Moses. The Law wasn’t given until 430 years after the promise was given to Abraham. Rom 1: 19 For what can be known about God is plain to them, because God has shown it to them. 20 For his invisible attributes, namely, his eternal power and divine nature, have been clearly perceived, ever since the creation of the world, in the things that have been made. So they are without excuse. 21 For although they knew God, they did not honor him as God or give thanks to him, but they became futile in their thinking, and their foolish hearts were darkened. 22 Claiming to be wise, they became fools, 23 and exchanged the glory of the immortal God for images resembling mortal man and birds and animals and creeping things. Rom 2: 14 For when Gentiles, who do not have the law, by nature do what the law requires, they are a law to themselves, even though they do not have the law. 15 They show that the work of the law is written on their hearts, while their conscience also bears witness, and their conflicting thoughts accuse or even excuse them 16 on that day when, according to my gospel, God judges the secrets of men by Christ Jesus. Generally knowledge of God, His attributes, good and evil are visible in nature, and always have been. These examples are consistent with what Paul taught in Romans. None of them demonstrate that the 10 Commandments were being taught before Moses. Every time that this lesson has touched on the relationship between law and grace, it has done so from an Old Testament verse. In the most recent example, the lesson draws on the Old Covenant itself as the basis for understanding this relationship. The passage discusses how God will bless the people for obedience and punish them for disobedience. There is no mention of faith, repentance, forgiveness. If this is the source for the Adventist understanding of the relationship between Law and grace, it is clear that there is no “relationship”. Instead this is unadulterated Law. There is nothing in the phrases “kingdom of priests” and “holy nation” that suggest a role as a “mediating priesthood for the whole world. Given how specific the Old Testament commands to Israel are, one would expect to find instructions to the nation about sharing the 10 Commandments with all other nations, but there are none. If Israel is serving as a mediating priesthood for all nations, then one would expect instructions about this in the feasts and sacrifices, but again there are none. There is no evidence that Israel was ever tasked with sharing the Law with the surrounding nations. There is a continuity that runs from Adam to Abraham; which passes on to the church today. It is not the Law. That continuity is Christ. Adam was the first to receive the promise of the coming Messiah in Gen 3. Abraham received the promise of the blessing to his seed, namely Christ. We live in the partial fulfillment of that promise, the Messiah has come and will come again. The one thread of continuity running through Scripture and binding together all of God’s people across all time is the One through whom all are saved, the Lamb slain from the foundation of the world, Jesus Christ. Which will you chose, the Law or Christ?